The First World War was a singing war. 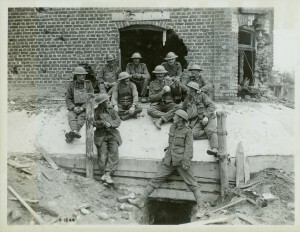 Soldiers used songs to bond and to alleviate the stress and fears encountered at the front. They shared songs with each other at base camps, while marching, and in the front lines. 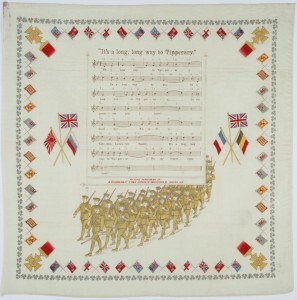 There were popular songs of the war, like It’s a Long, Long Way to Tipperary and Keep the Home Fires Burning, as well as many songs drawn from contemporary music halls. Sentimental ballads were as popular as irreverent ditties. In addition to the songs coming from the home front, which were often sung in the trenches, many soldiers took these songs and parodied them, adding new lyrics to the existing tunes. These new soldiers’ songs often focused on antiwar or antiauthoritarian themes, and few outsiders, especially civilians, knew what to make of songs with morbid titles like We’re All Waiting for a Shell or Hanging on the Old Barbed Wire. A Canadian soldier entertains comrades with a homemade instrument. Music and singing were popular pastimes.